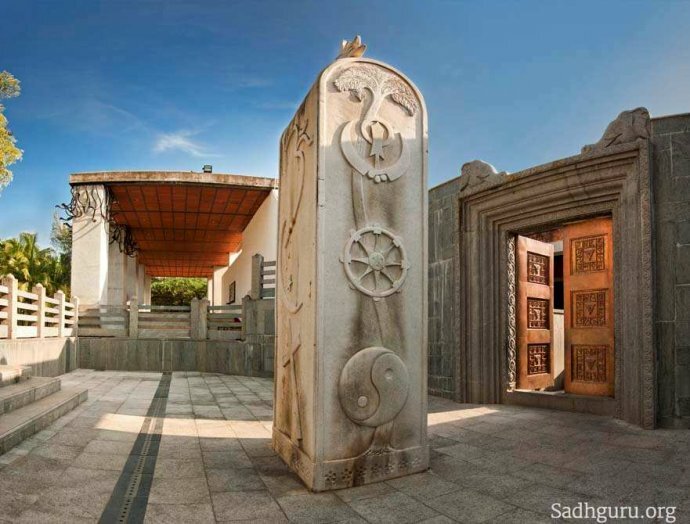 Its a place dedicated to meditation, consecrated by Sadhguru Jaggi Vasudev using Prana Prathishta - a complicated process by which all seven chakras are energized to its peak and locked inside the structure. It is said that this was the first complete Dhyanalinga in over 2000 years and it’s been estimated that the energy will be contained within this structure for at least next 5000 years. This place is located around 30 km from Coimbatore, inside the forest. There are frequent bus/cab services available from Coimbatore. Since then, I have decided to be open to others religious/supernatural / cult / cosmic being / spiritual beliefs, I’ve been in many discussions with many of my friends with alternate belief systems. I did not criticize or evaluate their belief system with my rational thinking process, instead, I just listened. I got to know so much information that I did not know before. One such discussion was about people having different experiences with Dhyanalinga’s energy. Thanks to Dinesh for providing me the complete picture of the process that was involved in creating this Dhyanalinga. Though I did not understand many of the concepts - I know now, the rough idea behind this structure. I decided to find that out by myself. Me, Sangavi, Arthi and three of her friends set out to Dhyanalinga in a car and a bike. The route to this place was really lovely with green trees/vegetation on both sides. We reached the place in mid-noon with the scorching sun above our head. This place has to be maintained in complete silence. So they collected the cameras, cell phones other items in the entrance itself. It’s free. I have used the pictures I got from the Internet on this blog to give you a visual experience. You are welcomed and greeted by the volunteers. If you are the first time visitor to Dhyanalinga, you will be shown a small documentary movie about Dhyanalinga. I would suggest you watch it. Next is to have a dip in the holy pond to energize yourself and to dissipate the heat. You need to shower yourself before getting into the pond. They will provide you with a saffron color towel. You are supposed to remove all the clothing and wear only this towel. They charge Rs. 20 for each person. 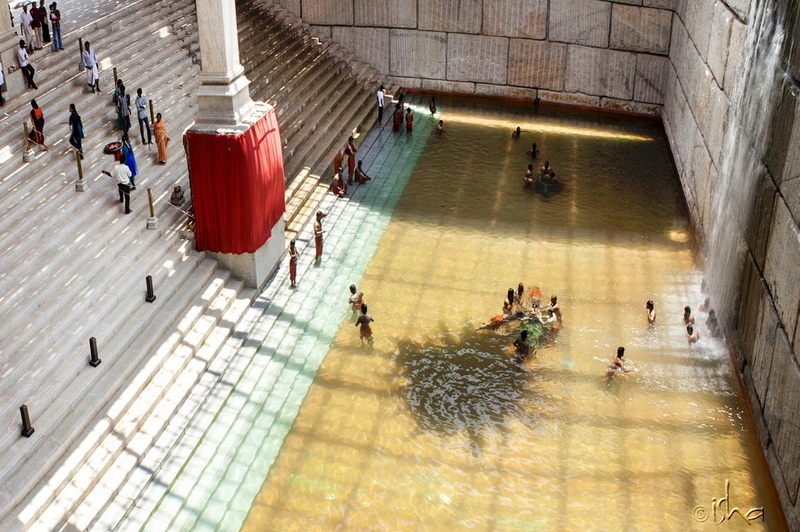 The pond called “Surya Kund” is constructed 30 feet below the ground level. The depth of the water is 5 feet. This pond has three consecrated Lingams and an artificial waterfall. You are supposed to walk slowly into the pond, touch the Lingam with both your hands and take a dip in the water. The water is so chill and so clear - I could see the toes, nails on my feet. It was as if I am watching through a magnifying glass. Once you take the dip - your body is cooled down immediately with the cold water. This is a surreal experience. I thought this experience is worth the visit to Dhyanalinga. I walked through the pond slowly, touching the Lingams, taking dips in the water, standing in the waterfall. I did not feel anything spiritual - but it was a lovely experience. I did not feel any sort of energy passing through me. This above place is only for Men. 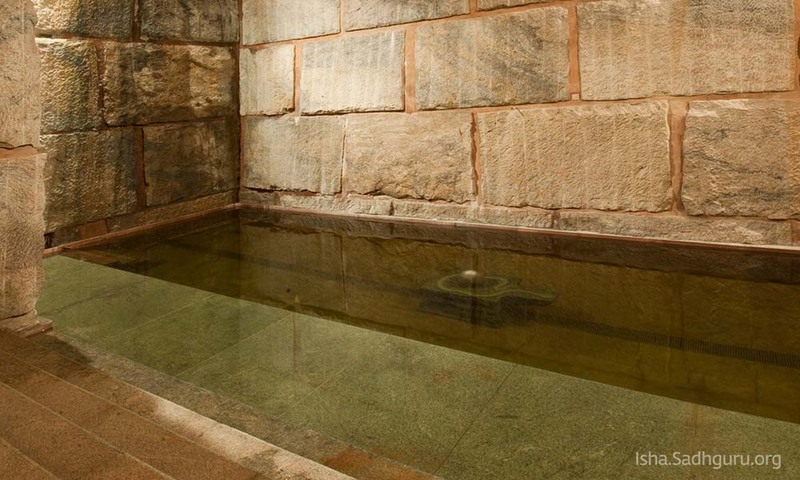 There is a separate pond called Chandra Kund which is reserved for women visiting Dhyanalinga. I strongly suggest you take a dip, whether you are religious or not. It’s a lovely experience. There are volunteers everywhere to guide you to the places and to answer your questions. 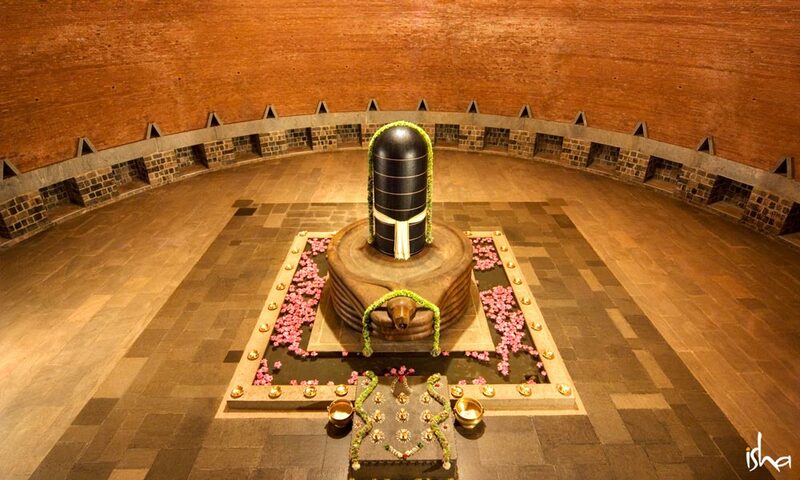 The old volunteer in front of this temple explained that this is the feminine form of Lingam. 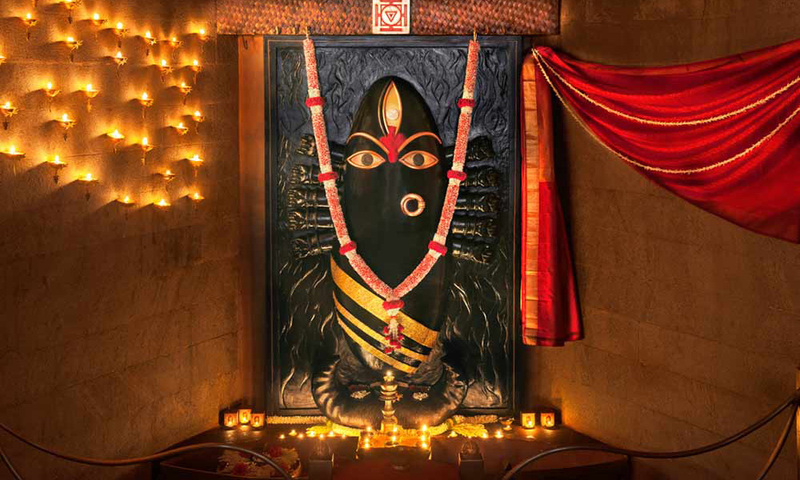 You can worship Linga Bhairavi as you would do to other Hindu gods. There are requests made to her, in exchange for flowers and poojas. A typical Hindu establishment. I seriously do not see a need for this temple inside a meditation place. I saw a lot of foreigners in saffron dresses doing poojas, offering flowers, doing meditations etc. A typical scene in an Ashram. She offered me Neem Leaves and Lilly flowers inside the temple. I was supposed to eat the Neem Leaves. It was bitter than the Bitter Gourd. Luckily they sold Pasiparuppu Payasam just outside the temple for Rs. 10. With the help of the payasam, I could eat three Neem leaves. Even though we knew the benefits of Neem leaves, this is my first successful attempt at eating them. I was proud !. We saw a small beautiful artificial pond with Lillies and Goldfishes, on the way to Dhyanalinga and spent some time walking around the pond, watching the flowers and fishes. It was good. A big 15 foot Nandhi interrupted us on Dhyanalinga’s entrance. Its made up of a metal alloy, filled with herbs inside, consecrated by a ceremony. 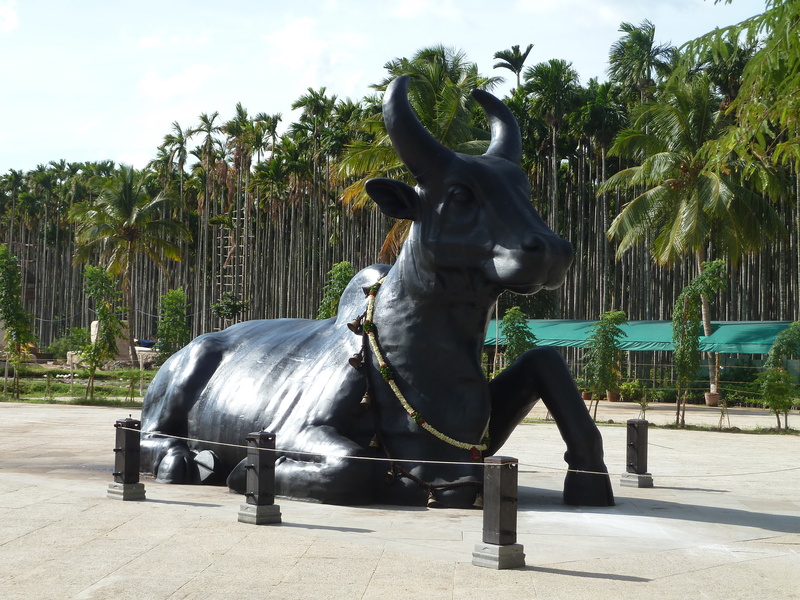 It was painted in pitch black color and looks majestic than the Charging Bull in front of Newyork Stock Exchange. We were not allowed to touch or climb the Nandhi. We saw Sarva Dharma Sthamba, just before the entrance, signifying singularity or union of all religions. This stone has the inscriptions of symbols of Hinduism, Islam, Christianity, Jainism, Taoism, Zoroastrianism, Judaism, Buddhism, and Shinto welcoming people from all religious beliefs. I am not sure how many people actually notice this Sthamba. I did not see a single person looking or checking this out. Maybe this should be placed in a more strategical place or should be made more attractive - to convey the message. Finally, we are into Dhyanalinga. The side walls on the path to Dhyanalinga has stone sculptures depicting many scenes in Hindu mythologies. This is not congruent with the Sarva Dharma Sthamba we saw outside. The volunteers allow people to go inside Dhyanalinga in batches, every five minutes. There are 27 enclosures on the sidewalls of Dhyanalinga. You can either sit inside the enclosures or in the open space for meditation. The five minute time is for the people who just came to visit. If you want to meditate longer, you can do it. No one will disturb your meditation. I was surprised to see the pillar-less construction of such a big dome. My surprise increased a thousand times when I heard that this was constructed without Steel & Concrete. This was built with the ancient Indian technique with brick, mud, lime, clay and some herbs. It is properly ventilated and illuminated - perfect for meditation. It is said that this structure will withstand for at least 5000 years. There was such a silence inside Dhyanalinga where I could hear my wife’s earring swinging. It was very serene. I occupied one of the enclosures and started to meditate. I expected some sort of energy to flow through me or a sudden relaxation or calmness in the body and mind, as it happened to many others. But nothing happened. I actually slept. I woke up when I heard the sound of people walking out for the next batch. That was a big disappointment for me. I came to Dhyanalinga with an open mind to experience it. The above statement by Sadhguru is not true in all cases. But, I heard from my close friend that he felt the energy (he never lies for anything in life). So, I can conclude that the above statement may be true for a few people (maybe religious?). Objective failed, but the experiment was a success. I enjoyed the trip to Dhyanalinga. Why should You visit Dhyanalinga? The architecture and construction techniques is nothing short of any other marvelous constructions in the world. It’s a must see if you like to travel. The refreshingly chill holy dip in Surya Kund. This is the best and I loved it. The biggest meditation place in the world, situated in the forest. If you are interested in meditation, then this is your Mecca. You can book in advance and stay in the Dhyanalinga premises for several courses on yoga, meditation and mindful living. Though I did not experience what I wanted to experience, I will try once more. Next time, I am planning to stay in Dhyanalinga for a week or two to learn yoga, meditation etc., Maybe I will experience something new or never. Who knows!